A spinning rod is perhaps one of the most common rods for anglers to use, due to their ease of use and reliable performance. While they are best suited for small or medium-sized fish, some spinning reels carry enough strength and power to match larger fish species. Part of what makes spinning rods so desirable is that spinning helps anglers cover large segments of water throughout the day. Spinning rods are also naturally balanced, as the reel hangs directly below the rod itself. Using a spinning rod means utilizing a simple, straightforward method of fishing. It is also one of the most convenient and efficient means of fishing, making spinning rods into valuable tools for each and every angler. To assist anglers in their search for a spinning rod, this review has compiled a list of the top-rated spinning rods that are currently on the market. Each one of these models has gotten wide amounts of positive reviews for elements of strength, durability, and performance. By looking at the top-rated spinning rods, anglers will be better able to compare and contrast the most sought-after features, pinpointing the spinning rod that will work best for their own fishing needs. As a fast action spinning rod, the Shimano Solora manages to combine high levels of function with high levels of durability. One of the best things to note about this Shimano model is that it comes at an extremely affordable price, which certainly adds to its long list of positive reviews. For a rod that offers high-quality performance at an affordable price, the Shimano Solora stands out against the competition. The aeroglass fiberglass construction provides strength and durability to last through years of wear and tear. As an additional feature, the fore and rear grip handles are made of cork to improve comfort and grip, even during wet conditions. Overall durability is enhanced even further by the reinforced aluminum oxide guides, and the graphite reel seat which keeps the reel snugly locked in. 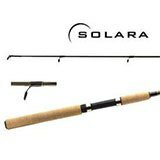 Reviews note that the Solora spinning rod carries a surprising amount of power while casting with ease, solidifying this rod’s spot as one of the best spinning rods to invest in. An incredibly well-known name in rod design, the Ugly Stik series has been a best-selling series for decades. The Ugly Stik rods are one of the most durable rods available, particularly when compared to similar graphite spinning rods. With five different lengths to choose from, anglers should have no difficulty finding the right length. Depending upon the length, the Ugly Stik Bigwater spinning rod will fall into a range of power, from medium, medium-heavy, and heavy. The 7 and 11-foot rods are the most powerful of the group, with theheavy power to bring in the largest and strongest of fish species. The line guides on each and every Ugly Stik model are composed of stainless steel with aluminum oxide inserts, ensuring that even the most brackish water won’t cause corrosion. As an additional benefit, the reel seats are outfitted with corrosion-resistant stainless steel hoods, making this spinning rod perfectly suited for freshwater and saltwater use. 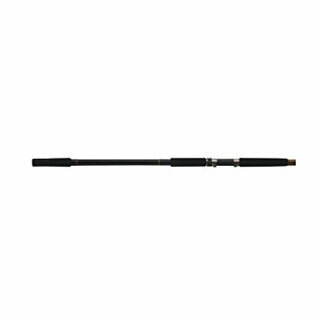 The Calico Jack rod series from Hurricane is one of the most versatile and sought-after rod series on the market. For anglers who are looking to use their spinning rod in a variety of environments, this series is the perfect option, as it is formatted for protection and durability in saltwater and freshwater environments. 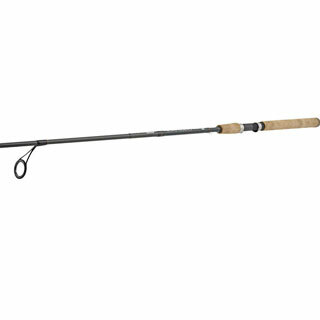 The graphite rod blank makes this spinning rod not only durable but also lightweight. Graphite rods are also more sensitive when compared to rods made out of fiberglass, so anglers can be assured that the rod will respond to even small nibbles and bites. The lightweight quality of the rod also allows for less stress on joints and even a wider range of casting techniques. 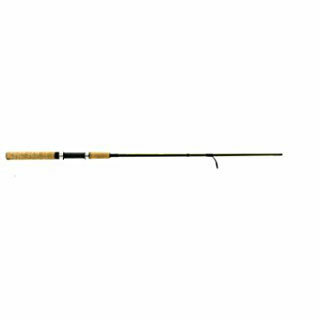 This rod comes in four different sizes, with spinning rod length ranging from 6’6” to 8’, and rod power ranging between medium light and medium heavy. By providing plenty of options, anglers of all ages and skill levels will find the right fit for them with a Hurricane Calico Jack spinning rod. For anglers who are constantly on the go, or for anglers who like to bring their spinning rod along on camping and backpacking trips, this Piscifun spinning rod is the perfect solution. Its compact design allows for the rod to separate into four different pieces, making packing a breeze. The carbon fiber blank has been triple bonded to enhance durability and performance. This triple bond includes a carbon core to provide action and sensitivity, and an outer layer of 8-ton E-glass adds strength and flexibility. The ceramic line guides are spaced to promote friction-free line flow, while also improving casting capabilities and rod sensitivity. 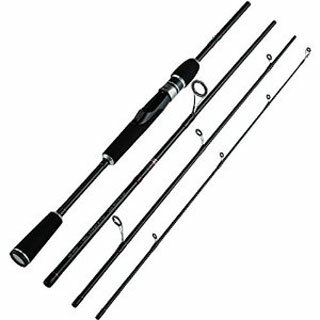 The Piscifun Spinning Rod comes in three different sizes: 6’6”, 7’, and 7’6”. For anglers looking for a spinning rod that can handle intense weight while exerting maximum power, the Piscifun Spinning Rod is a perfect choice. For anglers who want to avoid the hassle of a large, bulky rod, the Daiwa Mini Spinning Rod is a wonderful option. Not only is it extremely portable, but at a total length of 4’5”, it is incredibly lightweight and easy to use. 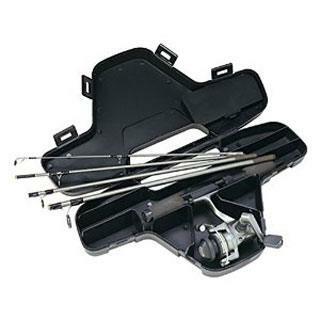 The included compact carrying case not only comes with superior rod storage, but it also provides room for tackle and bait, as well. This combo is also a great option for anglers who don’t want to bother with the stress of finding the right reel for their spinning rod. This combo comes with a pre-fitted spinning reel, with a 5.1:1 gear ratio and a smooth, multi-disc drag. Not only is the reel perfectly suited for the rod, but it also comes with high levels of power and performance. What truly makes this spinning rod into a top-rated rod is the extreme portability and ease of use, making it ideal for anglers who are consistently traveling, or for beginning anglers who are just learning how to use a spinning rod and reel. Finding the right spinning rod is much easier when examining the top-rated rods, but it also involves taking a close look at a few innate qualities of the spinning rod category itself. When looking for a spinning rod, it is important to keep these in mind, as these qualities will often make a huge difference when selecting one spinning rod over the other. This certainly doesn’t mean that anglers need to look for pre-packaged sets of spinning rod and reel combos, but it does point to the importance of appropriately matching fishing equipment. Even the best spinning rod won’t perform well if the spinning reel is not matched properly. If you already have an idea of what type of reel you would like to use, then structure your search for a spinning rod around the reel. If there is a spinning rod that you are sold on, make sure that you look for a reel that matches properly. This will ensure that you will get the best possible performance from your spinning rod. Each and every angler is likely to have at least one brand name that they stick to for fishing equipment. While there is nothing wrong with this, it can certainly pose a problem when looking for the best-fitting spinning rod. For spinning rods, keep in mind that the best things to look for don’t always revolve around brands: having a durable, efficient spinning rod that fits correctly with a reel is the most important part. Performance is key, and for spinning rods, that often coincides with fit. This will determine the level of flexibility that the rod has. Flexibility is measured on the backcast, meaning that the more the rod bends during the backcast, the more flexible it is overall. A slow-action spinning rod will have the greatest amounts of flexibility, while a fastaction spinning rod will be almost entirely rigid. A medium-action spinning rod will be the most versatile, falling somewhere in between rigid and fluid flexibility. Rod action can be of particular importance with spinning rods, as they are typically used for enhanced finesse and techniques during casting and retrieval. Make sure that the spinning rod you invest in will have the proper amount of action to facilitate your preferred fishing style and method. Ultimately, finding the best spinning rod comes down to personal preferences and fishing habits. Spinning rods are essential tools for any angler who is looking to work on finesse and variated fishing techniques. Their characteristic ease of use also makes them into highly sought after rods. When looking for the best spinning rods, examining the top-rated rods can make a world of difference. The top-rated spinning rods will all have common characteristics of strength, durability, and performance. Understanding these characteristics can help each and every angler pinpoint the right spinning rod for them.